This week, I’m unsure how to go about my blog post. TI have several things to say so bear with me as I try to work out a way to jemmy them all in at once. 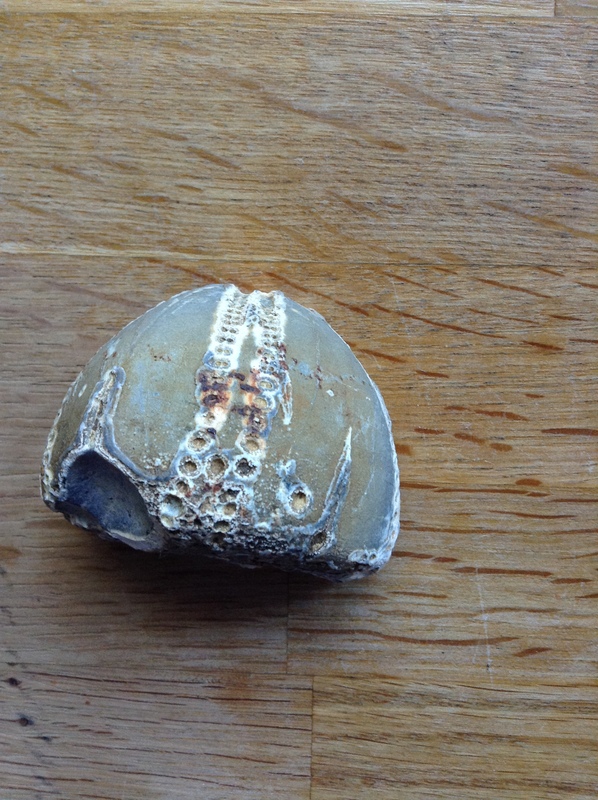 Ever in pursuit of the elusive hammered coin or interesting… thing, I went out metal detecting yesterday. I learned three things. First that no matter how many smashing Saxon artifacts other people are digging up you have to walk over one to find it. Second, I learned that my waterproofs are not waterproof any more. This lesson delivered as I was the wrong end of a field, about half a mile from the car, in a deluge. More waterproofs required, I think. The manner of my learning this rather sums up my day. Third, on returning home, after steeping in a hot bath, I learned that basically, I’m doing setting the detector up right, choosing sensible places to detect and doing the right thing. I am finding tiny things as well as big things, I am finding things made out of metals and alloys that mirror the good stuff but unfortunately, they are bits of tractor and modern stuff rather than interesting finds. I’m finding miniscule things the size of a quartered silver coin, but they’re tiny pieces of metal. All are things which, in happier circumstances, could be good stuff. My point is that, for the most part, I’m doing it right, it’s just that the artifact gods are not smiling as benignly upon me as sometimes. 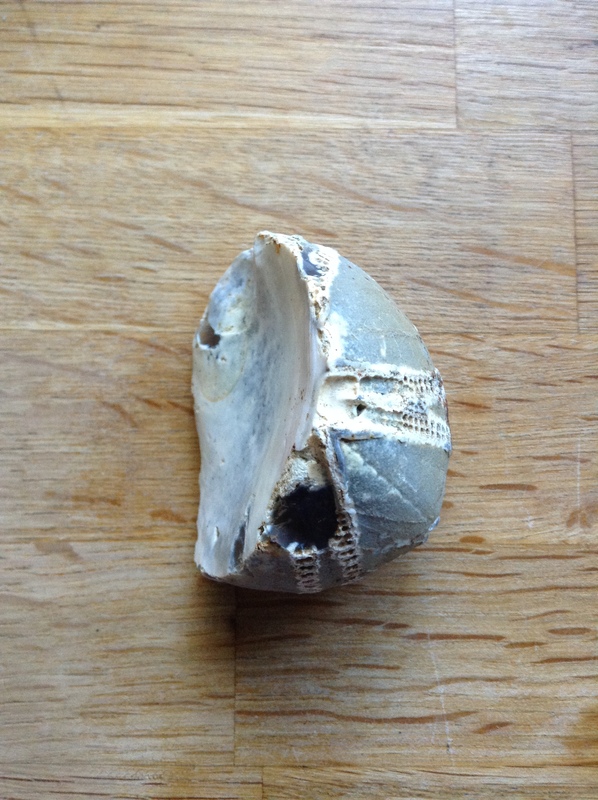 In a sop to my efforts, they (the Small Gods of Lost Things) did throw me this fantastic fossil of half a sea urchin. It holds a level of detail I’ve not seen outside the real thing so my day wasn’t wasted. That white discolouration on the flat side means it broke in half several million years ago. Onwards and upwards. There’s another dig next week. Which kind of brings me onto the second thing. As you know, I’ve been a bit worried about my book sales recently. This is because I’ve been doing that fatal thing, comparing myself to other people. Really I should know better. In order to feel some semblance of control, and in pursuit of social media savviness, I bought and read two Rayne Hall books: Twitter for Authors, and Why Does My Book Not Sell? 20 Simple Fixes (Writer’s Craft). OK, if I can go off at a bit of a tangent here… I cannot recommend these books highly enough. I’ve always wondered how to interact with people on Twitter, Rayne Hall gives the answer. If the worst comes to the worst just go to her feed, eavesdrop on some conversations and have a chat. Her advice has definitely worked really well for me. Even in a week I’m having conversations and enjoying Twitter the way I wanted to but hadn’t. She also has what I consider to be an excellent attitude to social media, ie that it is social and that the more social and less of a book seller you are, the more likely you are to achieve book sales. This advice has been borne out by my own experience. Likewise, while I’d got more of my book production performance in line with Rayne Hall’s there are still plenty of things in Why Does My Book Not Sell? 20 Simple Fixes (Writer’s Craft) that I can apply to my own books. However, what I have learned from these two books, above all, is that for the most part, and barring a few tweaks, I’m doing the right thing. My book sales are not lighting up the sky, though. Perhaps, like my efforts at metal detecting, the small percentage of fairy dust required is just absent from that part of my life at present. Perhaps. But if I’ve learned anything from metal detecting, it’s that perseverance pays off. If you keep believing and keep digging you will find interesting things. The law of averages demands it. You can’t find nothing but crap. Sure a big part of your detector finds may be but they can’t all be. And they aren’t. Not even for me. Am I simply lacking fairy dust. Or are my book sales better than I think? You see, it may be that for someone who has written a book that is, as a friend who works in magazine publishing put it, “Absolutely wonderful, but a very hard sell. I wouldn’t touch it with a barge pole if it was submitted to me,” I’m actually doing better than I think. Usually, a handful of people download my free book each day. Since it went free, in February, I’ve seen a sudden increase in sales of the second book after which, in June and July, I definitely saw an increase in sales of books 3 and 4. From selling a couple of books a month if I’m lucky and shifting a couple of my, admittedly, dodgy free shorts a month, there are now only a couple of days each month when nobody downloads anything. Don’t get too excited. I’m not ready to make one of those gushing, “I can’t believe that my book is number one on Amazon!” posts on Kindleboards. I’m not even ready to make one of those “my sales have plummeted! I’m only selling 500 books a month” posts either. Mwah hahahargh! I dream of selling 500 books a month. However, it’s all relative. This time last year I’d failed to sell a single book in three months straight. This year, to my eternal delight, even Kobo users are buying them. The Amazon stats are showing international sales. For the first time, people in France, Italy, Canada and Australia are buying them. For the first time since 2010 I am achieving monthly book sales that go into double figures. The free book, Few Are Chosen, K’Barthan Series: Part 1 is even being downloaded from Google books — although I’m not sure what’s happening there because nobody has bought the others, I’m not even sure if Google is selling them or just pointing people to the vendors links on my website, but it’s a start. Forget about how far you have to go, instead see how far you’ve come. Trust me. The answer to that question is always going to be, a lot further than you think. Which is kind of where I am about now. So, am I earning much? No. The people around me, the authors I chat to from day to day, are earning far more. Am I successful? No. My literary mates are, for the most part, several orders of magnitude more successful then me. Am I doing better than last year? You bet your arse I am! Yes, sure, as flat figures, my book sales are risible. But as a percentage increase on previous efforts they are flying. It’s all a question of how you view it. Sure, in the order of publishing species I’m so low on the scale that I’m aspiring to be a molecule — BUT, and here’s the rub, things might be different next year. Coming next week… news of my latest story, out November 1st.